We would like to make you aware of the following opportunity within the PRACE consortium. If you wish to apply for a resource allocation under this scheme then please make sure that you can fulfill the necessary conditions including the scalability and readiness criteria. 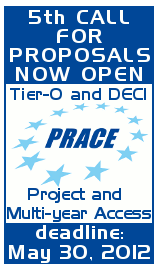 PRACE – the Partnership for Advanced Computing in Europe – makes it possible for researchers from across Europe and the world to apply for access to Tier-0 HPC systems via a peer-review process.